Seriously can HK movies cover get cheesier than this, with a yellow background, an aging Ekin trying to look 20, and Miriam Yeung with a kung fu pose? Geez, whoever design this probably have the same talent as the one that design Jet Li's Miramax dub movies or even the latest Hero design! 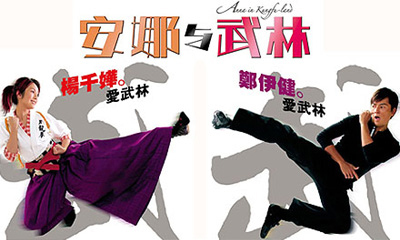 Oh yeah, I haven't even comment about the title: Anna in Kungfu-land, okay, right, yea... sounds more like a fairytale. Alright as the old say goes, never judge a book by its cover, okay then how about the substance, well, to be honest it is pretty good mindless fun and watching Miriam doing cheesy kung fu moves (yeah right, more like stunt doubles) is hard not to laugh. So does it succeed, well, if you compare the movie with the cover, I must say it is not as cheesy. Just in case you don't notice, sorry for using the word 'cheesy' so many times, but it is just so cheesy. This is the back cover description: Miriam Yeung & Ekin Cheng let their martial arts talents speak in "Anna In Kungfu-Land"! Under the guidance of skilled director Raymond Yip the 2 top stars charge up to super comical form! Ekin Cheng portrays A Jian who tries to impress his employers by staging a captivating Kung Fu tournament whose winner has the chance to become a big movie star. Finally, A Jian is lucky enough to encounter female police officer Anna (Miriam Yeung) who falls in love with him during many turbulent circumstances that promise to keep your eyes fixed to this merry movie delight! Okay, start laughing, what the hell, since when did Miriam and Ekin ever had martial arts talent, and what a misleading advertising when Ekin did not even punch someone in the whole movie. May be I can sue it for misleading advertising, yeah may be. Alright lets get to the point of writing this review, wait do I even have a point, alright I will think of one. Miriam Yeung is without any doubt, not pretty at all, but it is her personality of always smiling that made her an attractive character. With Sammi doing a Stephen Chow style of 2 years a movie or may be 1, Miriam is becoming the Queen of boxoffice. Sure, many of her films are funny, especially Love Undercover, but she has also make some really stupid and real dud movies like Love Undercover 2. Well, she is likable, but is very much a hit or miss, meaning that you either like her or hate her. Ekin, well he is just him, basically someone that have turn from a teen idol to become a cheesy idol. Needless to say more, but the highlight is probably Denise Ho who is really cute in police uniform and that Jap guy from Fist of Legend did a promising cameo opening fight scene that really gave the movie some kind of hope of a good action movie. However, the effect is like air popping out of a balloon. So yet another cheesy movie starring Miriam Yeung and the cheesy idol, so what more is needed to say. Alright let's get it straight, jokes are installed throughout and with some fun supporting turns, and Miriam doing kung fu moves (stunt double) well at least seemingly is funny. So what's wrong with the movie, no not that cheesy idol, not his fault, but ultimately it is the bad action and a stupid resolution of the supposed conflict of Ekin - one feet on two boats (Chinese) that made this movie just beyond cheesy. Alright, maybe it is not that bad, and in fact it does have plenty of funny moments to make it a mindless fun movie ride. Maybe it is because I ate too many cheese. Alright, to be honest in this day and age, it is what I call an alright movie.